LEGO Marvel's Avengers is a video game released in January 2016.. 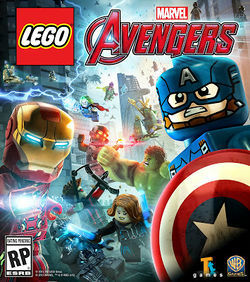 Unlike LEGO Marvel Super Heroes, the game is based on the events of Marvel's cinematic universe, with levels and characters being based on the events of The Avengers, Avengers: Age of Ultron, Captain America: The First Avenger, Captain America: The Winter Soldier, Thor: The Dark World and Iron Man 3. An exclusive Mark 33 Iron Man polybag was given away with pre-orders of the game. There are 174 characters in the game, not including alternate costumes and 19 DLC characters. Facts about "LEGO Marvel's Avengers"
This page was last edited on 16 May 2017, at 08:44.